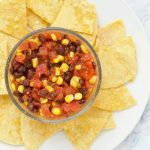 This quick and easy Black Bean and Corn Salsa recipe takes just 6 ingredients to make, with no chopping or cutting required! If the seasoned tomatoes don’t have enough garlic flavor, add 1 teaspoon of garlic powder. Add 1/8 teaspoon of cayenne or crushed red pepper for a more spicy flavor.